Each Reycle Bin sold seperately. Choose between lid for paper (blue), bottle lid (red) and dual bottle & paper lid (green). What is the purpose of a Standard Office Recycle Bin? Space always comes at a premium, and when going green is a priority, there needs to be a perfect balance between economy of space and conscientious living. The standard office recycle bin from the house of Rubbermaid is highly recommended for those striving for a greener earth but struggling with space in their home or office. True to its name, the standard office recycle bin has a thin 279mm profile that will slip easily into tight spaces, giving you a great opportunity to recycle paper, bottles and other items without compromising on floor area. 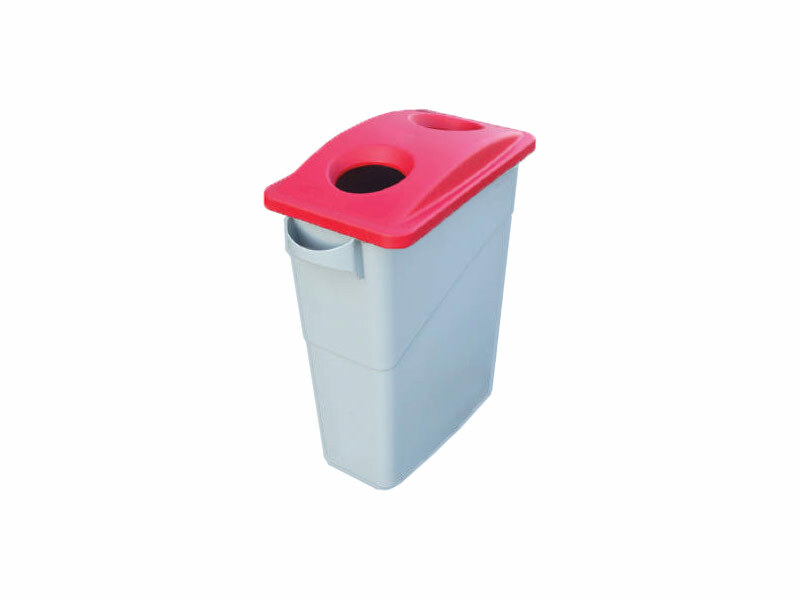 Special colour-coded lids make it easy to identify the type of material that goes into each bin, and these lids can be purchased separately. 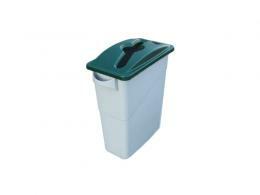 Where can a Standard Office Recycle Bin be used? In one word, anywhere! Recyclable waste is generated everywhere – in homes, offices, businesses, factories, entertainment hotspots, recreational facilities and many other locations need convenient ways to help people recycle their waste. 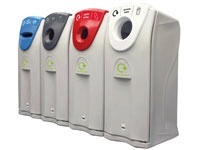 The coloured lids are easy to identify and come in three variants: blue lids with slots for waste paper, red lids with bottle slots for glass waste and green bins that can accommodate both – these three bin lids makes it simple and convenient to identify what goes where. Wherever glass, paper and other waste is generated on a regular basis, the standard office recycle bin can save the day – and the world. This hallmark product can be used by anyone who wants to do their bit for the environment by recycling their inorganic waste. Segregation is the key to waste management and recycling, and the three bin lids will make it easy for anyone to know what type of waste goes into which bin; that means there’s no more sifting through the rubbish at collection time to ensure that different types of waste aren’t mixed in with each other. Convenience is king in today’s world, and anything that makes life easier and helps save the earth at the same time is fit to be Emperor! Anyone who wants to do their part for a greener planet will find these bins and their corresponding colour-coded lids truly life-changing. The standard office recycle bin from the house of Rubbermaid is made from durable plastic, and uses an easy-to-clean design. The dimensions of the bin are 632 (H) X 588 (D) X 279 (W), and the handles on the side and bottom made them easy to empty when fully loaded. The lids are interchangeable and fit exactly on to the top of the recycle bins, giving a colour-coding scheme that’s easy to understand and use. The Workplace Depot offers a standard one-year warranty on all parts and labour. Our recycle bins fully comply with all local council and government regulative manufacturing requirements to ensure the safety of your customers and staff. 1 plastic bottle recycled can save energy equal to what a 60-watt bulb uses in 3 hours. 1 tin can recycled can save the same amount of energy used by an average TV in 3 hours. 1 glass bottle recycled can save the amount of energy that an average desktop computer uses in 25 minutes.